The words of a Spanish chat show hoaxer to Mariano Rajoy, lately Prime Minister of Spain. The hoaxer was impersonating Carles Puigdemont, the new secessionist leader of the Catalan separatists, who had pointedly omitted the vows of loyalty to Spain when taking his oath of office. Yet he might have been Rajoy’s dream caller – offering a deal to take him back to power. Rajoy (right) was fooled and offered to attend a meeting, saying that his diary was pretty empty these days, before the chat show host intervened. Since the inconclusive result of the Spanish General Election on 20th December, last year (2015) Spain has, technically, been without a government ( see Ring in the New ). Given the fractured state of the Parliament there are many permutations which would give an overall, if slender, majority, but, gradually it seemed over the last three weeks, these are being whittled away. Pedro Sanchez, leader of PSOE has ruled out any coalition which returns the PP to power. Pablo Iglesias, leader of Podemos, has set out stringent terms for any coalition with PSOE and ruled out coalition with Cuidadanos. While, not to be out-done, Albert Rivera, leader of Cuidadanos, has stated that on no condition would he allow Podemos to enter government. To add further complication, neither Sanchez (left) nor Rajoy enjoy whole-hearted support within their parties. Most particularly, Susana Dias, current President of Andalucia, is looking longingly at Sanchez position as leader of PSOE. 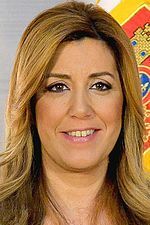 Dias (below left) features frequently in my local daily newspaper in Jerez, she’s very media friendly and adept at manipulating both press and TV. There has already been much rhetoric and several, dramatic, volte face. Britons have only recently become familiar with the power brokering necessary when coalition government is the norm, learning, largely, from TV dramas like the Danish ‘Borgen‘ and the French ‘Les Hommes des Ombres‘. ( Though Michel Dobbs’ political thriller ‘House of Cards‘ cornered the market on dastardly dealings in a British and, subsequently, an American context. ) The furious three-way wheeler-dealing following the 2010 British General Election was tame by comparison with what is happening now. Spain’s convolutions throw all this into the shade – in this case ‘life’ is more dramatic than ‘art’. So how is this to be resolved? The Spanish constitution ( which is a relatively new version, post Franco ) places the responsibility upon the King to talk with the parties and put forward a candidate to form a government. He/she will then be put before Parliament to get a necessary vote of confidence. The King has no experience of doing this. Indeed he has only been King for a short period of time, following the abdication of his father, King Juan Carlos, in June 2014. Nonetheless, last Friday, King Felipe VI proposed that Rajoy, as leader of the party which got most votes, form a government. But Rajoy declined, stating that, at that time, he would not garner sufficient votes in Parliament. He’s right, but he is also keeping his powder dry. Now Sanchez is furiously undertaking another round of negotiations. he may be the next candidate. Iglesias (right) has declared that Podemos will support PSOE. The latest news is that he and Rivera, the leader of the other new party, are now talking to each other – despite what each said earlier. And what if no potential government or coalition can attract sufficient support? There has to be another election. Already some senior political figures are assuming that this will happen, probably in May or June 2016, in an attempt to break the deadlock. This may sound the death knell for Sanchez’ career as leader of PSOE. He has already suggested that the party’s 39th Conference, scheduled for February and almost certain to elect a new leader, be deferred until the current negotiations are over. If a new election is called the conference will take place and Sanchez is likely to be replaced. Yet 61% of Spaniards said in a recent poll that they didn’t want an election re-run, preferring their politicians to come up with a compromise. At the local and regional level that is what Spanish politicians have been doing since the crash of 2008 and the emergence of Podemos and local variations thereof. Perhaps it is simply the logical extension to have a similar set-up at national level. However exasperating it may be to the Spanish electorate, to an out-side observer this is fascinating (which is not to downplay its seriousness). Who needs Netflix? Watch this space…. This entry was posted in From a Foreign Field, Political comment and tagged Political comment by juliej. Bookmark the permalink.